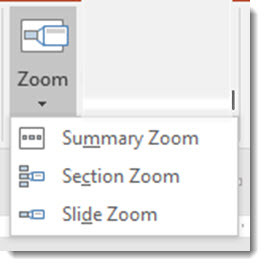 PowerPoint is adding a new feature named ZOOM. Zoom leverages the Morph transition and Sections to create a new way to quickly develop non-linear presentations with a new dynamic visual effect. Here is a quick demo of how easy it is to create custom shows within a presentation using Zoom. 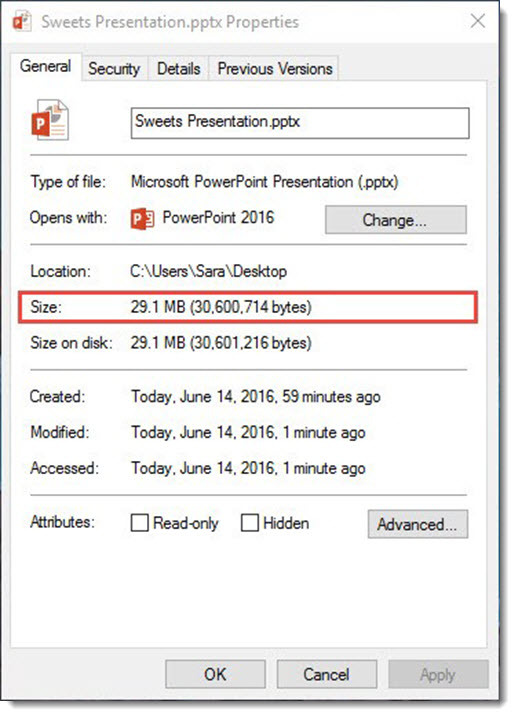 PowerPoint file size too big? Sometimes that’s okay if it has embedded videos, or just has a lot of slides. But if your 11 slide presentation has no videos and is 30+ MB, it is time for some file optimization. PowerPoint has built in tools to optimize images and multimedia – and they continue to improve. 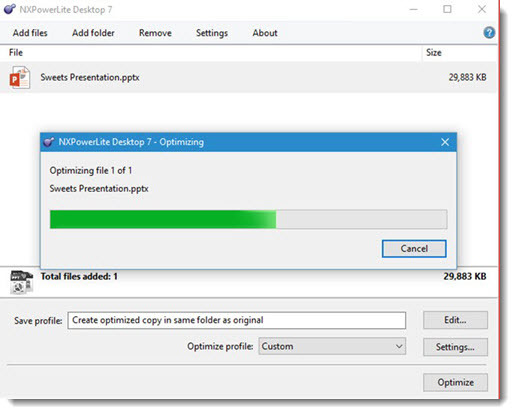 But for image optimization, I prefer to use one of the 3rd party add-in options, the NXPowerLite PowerPoint Add-in. For TLC Creative Services, we have NXPowerlite installed on all computers and use as needed. 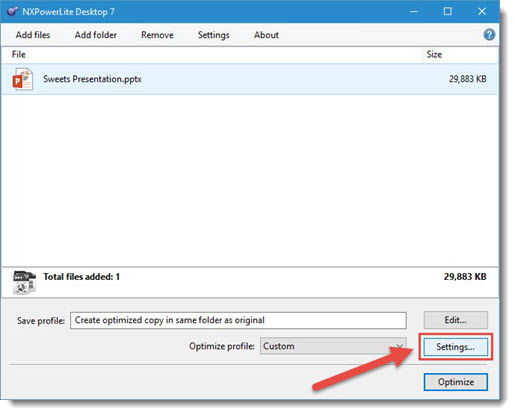 As stated on their site, what this add-in does is, “Shrink Your Files.” I’ve put together a quick explanation of how we use this at TLC. In this example, we’ve added a HiRes image to a PowerPoint Presentation. Our simple 10 slide presentation is a 29.1 MB file. The images within the presentation are 15MB, because they are far larger than HD projection, most are “print” quality resolution. 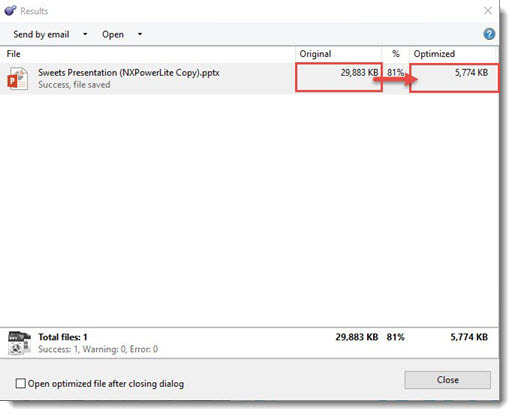 By using the NXPowerLite PowerPoint Add-in, we can optimize these images in order to reduce file size. Step 1: Save your presentation. Step 3: Select YES at this pop up dialog (unless you do not want to save over this file because you did not do Step 1 yet, then cancel, save the presentation and come back to this step when you can select YES). Step 4: Custom the NXPowerLite SETTINGS. Step 5: This should be a one-time process as NXPowerlite will remember your custom settings. Before we Optimize the file click on the File Naming tab. Here you can customized the text prior to Optimizing the file. 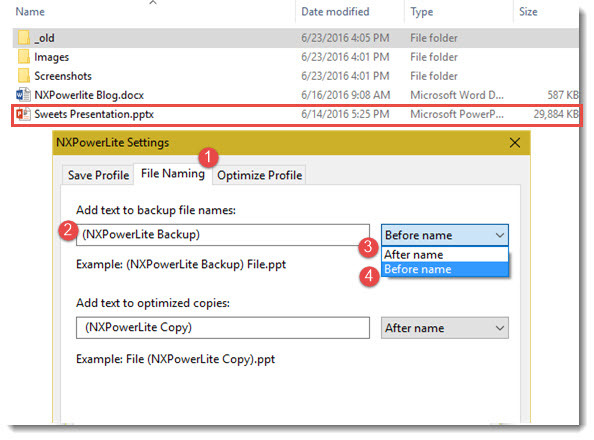 Back in the NXPowerLite dialogue, confirm the presentation is selected and click OPTIMIZE. 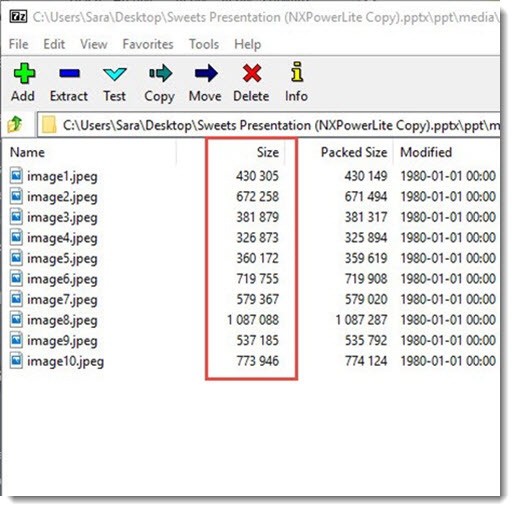 When NXPowerlite is finished, it displays the original and the optimized file size. In your project folder will be both the original (name now appended) and the new optimized version. Looking at the new optimized file, all of the images have been adjusted to HD (1920×1080 display resolution) and are approximately 6 MB (with no visible quality loss for the slide show)! From the entire TLC team, thank you to the NXPowerLite PowerPoint add-in for making our jobs a bit easier and quicker! Shyam Pillai is an incredibly talented and knowledgeable coder. Fortunately for everyone that uses PowerPoint, he has shared some of his expertise by releasing a number of incredible add-ins over the years. 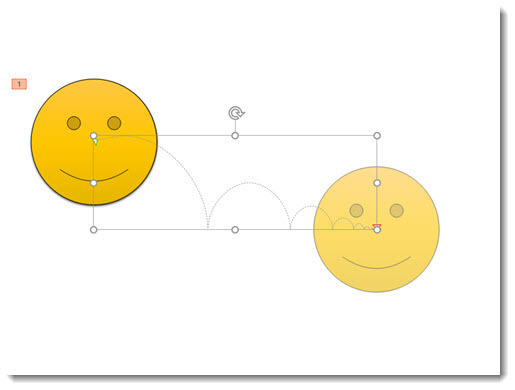 If you use Motion Paths in PowerPoint, this FREE add-in is a must have. 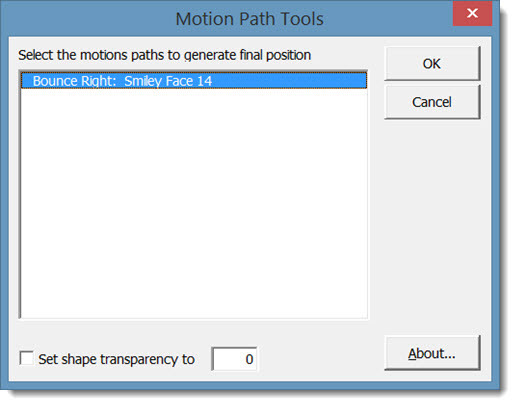 The Motion Path Tools add-in shows up in its own tab called “Tools.” When you have a Motion Path applied to an object, this add-in will copy the object and place the copy at the end position of the path. This is very helpful for lots of animation and layout needs – and can save lots of time! The add-in is found on a new TOOLS tab (where the developer has most of his add-ins install too). Here is a quick example slide with a motion path applied to the shape. 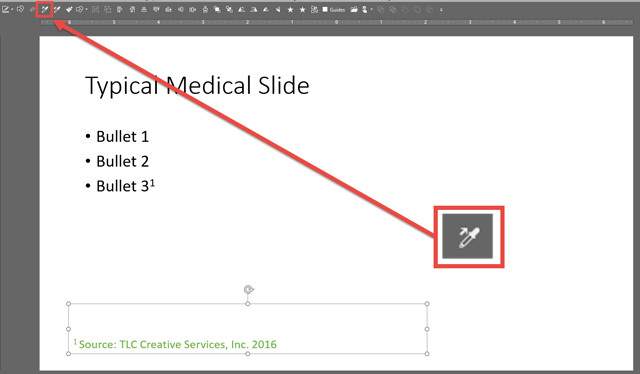 Starting with PowerPoint 2013, clicking on the shape while in the animation tab displays a ghosted version of the shape where the Motion Path ends – a very helpful improvement to PowerPoint! But in this example, what we really need is a copy of the shape in that end position. In the Motion Path Tools dialog, select the path you want to copy (this is pretty nifty because if you have multiple paths on a slide, they will all be listed here). Click OK and the add-in instantly copies the original shape (or photo or anything the motion path is applied to) and places the copy at the end point of the path! 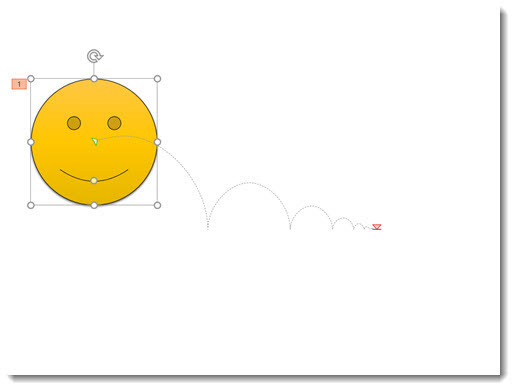 The most common design task is to copy that new shape, delete it from that slide, and paste it onto the next slide. 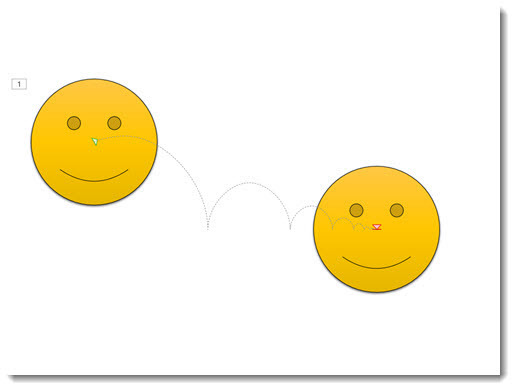 Now the Motion Path animation happens, go to the next slide and the shape is seamlessly in the same place! Get more details and download (this amazing add-in is FREE) here. Sometimes, the real power of an add-in is when it is used in combination with a PowerPoint tool. That is exactly what happens here as TLC designer Sara shows in this example of everyday PowerPoint formatting made much easier with Zebra on Wheels, which we also covered in the previous post here. 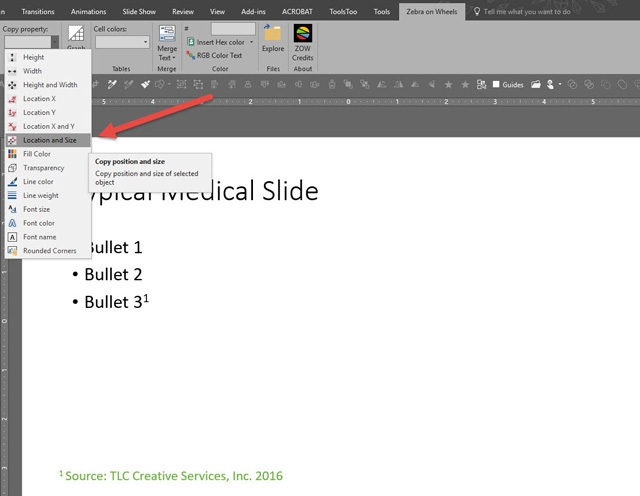 PowerPoint’s built-in format tool, the Eyedropper, can pick up font styling, line spacing, etc. and apply it to another set of text. This is a quick and easy way to achieve consistency throughout your presentations. Below is a quick example of what you can do with this great tool. However, with your free download of the Zebra on Wheels add-in, you can copy location and size of the text box, that you cannot with the eye dropper tool. Using the Eyedropper tool, the reference text box has been formatted to match what will be the master formatting used throughout the deck. Using Zebra on Wheels’ location and size tool, the reference text box is now in the same exact position and size as the master. This is important for line wraps, when the citation/references are long. Alone, both of these tools are great, but together, they make it possible to go through an entire 80 slide deck in less than 5 minutes and have every reference text box formatted identically throughout. Zebra on Wheels add-in can be found at their website here. Zebra on Wheels is another PowerPoint add-in that is FREE. Despite it being available for a few years, it is not common, partly because it is the name of a design firm based in the Netherlands. They developed their own PowerPoint add-in tool bar to make their presentation design easier, named it after the company and have generously made it available on their company website! To find more info or download Zebra on Wheels, click here. ToolsToo is the creation of another independent developer, and when it comes to making PowerPoint more productive, ToolsToo is amazing! The add-in has over 70 tools included, so it is a good thing it installs its own ribbon tab to house them all. On the technical side, ToolsToo is one of the few add-ins that is compatible with both 32-bit and 64-bit Office (virtually all add-ins are only 32-bit compatible). It is coded as a .com add-in vs. a VBA add-in which is more common. It is also one of the few add-ins that can have any button individually added to the QAT, which is great! Lastly, it is also economical costing only $20.00 for the full host of productivity tools. Make Same Size, Make Same Height, Make Same Width: Select shapes or images and instantly adjust so they are the same size based on the first item selected! 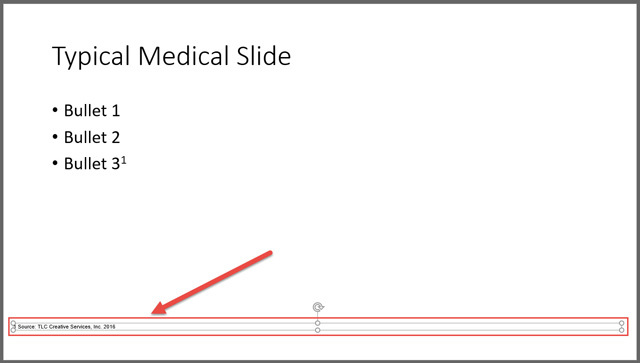 Make Same Rounded Corner: This is an agony point in designing with PowerPoint. The rounded corners automatically adjust their size based on the size of the shape/image and there is no way to set them to be the same across shapes. ToolsToo is worth the price just for the Make Same Rounded Corner tool! Make Line Horizontal, Make Line Vertical: Another pain point in designing content is determining if a line is truly straight, or 1/2 degree off… This simple tools forces a line to horizontal or vertical with one click. There are a lot of tools in this add-in. ToolsToo has become my highest used add-in when designing presentations. Find out more at the ToolsToo site here. 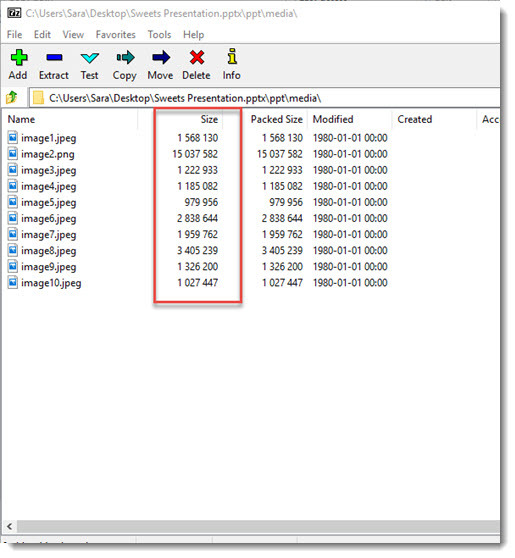 When you need to create images from slides, the PPTools Image Export add-in is invaluable. 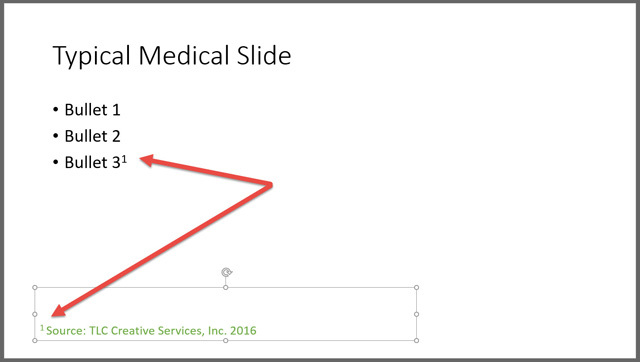 PowerPoint 2016 has updated the built-in tool for saving slides as images – and it is really good. But, I still prefer to use the PPTools Image Export add-in. The reason is that the export dialog gives me complete control over the image(s) created. Set the exported image size! 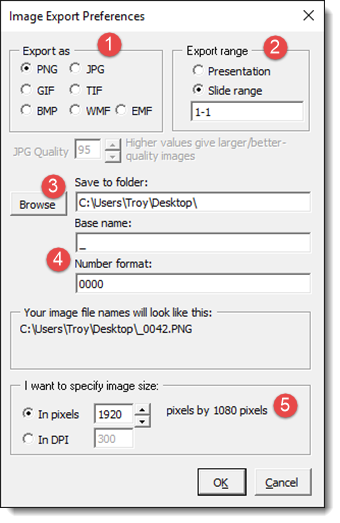 Find out more about PPTools Image Export tool on the web here. The PPTools Starter Set add-in should be installed on every PowerPoint user’s computer. This venerable add-in (which has remained in use by me since PowerPoint 2003!) has lots of time saving options. Memorize an Objects Position and Place Objects Exactly: This combination of tools is invaluable. Similar tools are available in other add-ins, but this a great solution. For example, you have a logo that needs to be in the same position on a number of slides – Position where you want it on the first slide, select the logo and click the MEMORIZE tool. 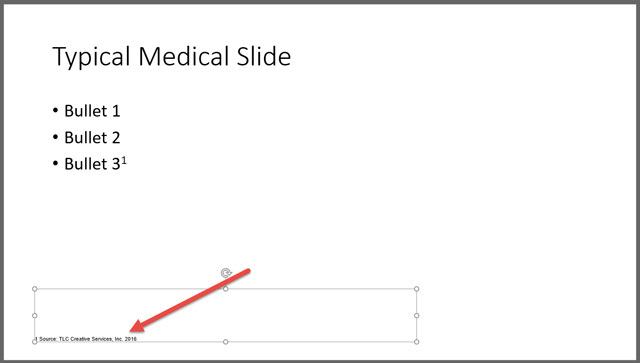 Now, go to any other slide, select anything and click the PLACE tool (aka: the hammer – to nail it in place) and it is positioned exactly the same as the first one! Enlarge and Shrink Text: Yes, PowerPoint has the exact same little A and big A icons and they do the same thing – make text larger or smaller. But, the difference is the native PowerPoint buttons jump the text size based on the preset Office text sizing (18-20-24-28-32-etc.). 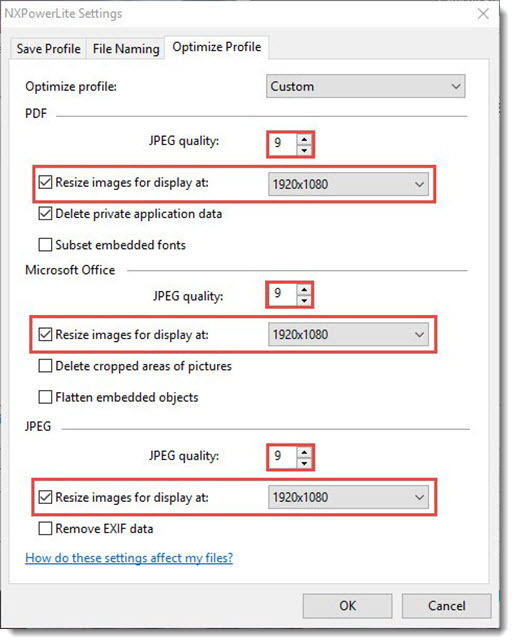 The PPTools resize text adjusts the text size by 1 pt at a time (19-19-20-21-22-23-etc. ), which is exactly what is needed for fine tuning a layout! Layer Manager: This tool is mostly outdated, but I like to use it as an example of how independent developers are often more in tune with real designer tool needs than the Microsoft Dev team. 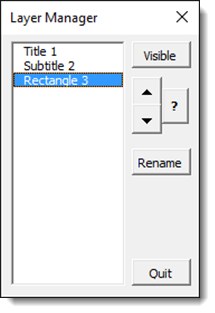 This amazing tool opens a small dialog and it is basically PowerPoint’s Selection Pane, allowing objects to be arranged in Z order and hidden – but it has been available since PowerPoint 2003! That is a summary of just 3 of the 15+ tools included with the add-in. There is a FREE version and a paid version with additional tools. Find it on the web here. This month, I am focusing on PowerPoint add-ins because the ability to extend PowerPoint’s functionality is one of the biggest attributes that allows it to be a “professional” design tool. 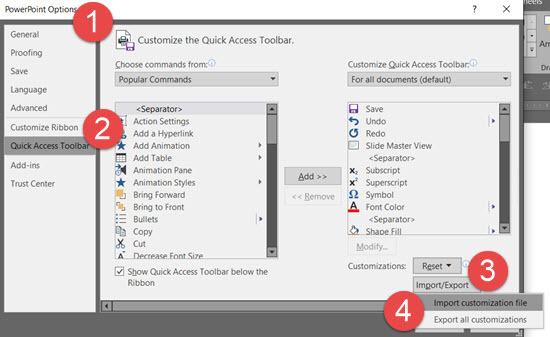 The first place to start is PowerPoint’s own extensibility with the QAT – Quick Access Toolbar. I am a big fan of the Quick Access Toolbar. My first post about it was back in 2009. Then, less than a year later, I became an even bigger fan when PowerPoint 2010 added the ability to export and import pre-made QAT toolbar setups. More recently, at the end of 2015, I became distressed over the QAT when an update to PowerPoint 2016 essentially limited its functionality – which has happily been fixed by the Microsoft PowerPoint Dev team (YAY!!). The first step in effectively using and setting up the QAT is to move it from above the menus to below. By default, it is above the menu bar (with FILE / HOME / INSERT / etc.) and only has a few buttons. Click the down arrow on the right and select SHOW BELOW THE RIBBON. At TLC, we have a very customized QAT installed on all of our computers – and has 37 time saving, always available buttons! For this blog post, I am showing our version that only uses standard PowerPoint features (I do run a more customized version that also integrates some tools from 3rd party add-ins – many of which will be in posts this month). Click HERE to download the TLC customized QAT (download .zip file, extract, then follow install information below). – Customized QAT is now installed! Can a Mobile Device Project? Yes it can! There is a lot of talk and excitement about using mobile devices, phone or tablet, to run presentations. And yes, I can confirm it is possible. But the question is – should you use a tablet or smartphone as the presentation “computer?” The answer – it depends on the meeting. Some presentations require a mobile device, such as a mobile app demo. But for a traditional presentation, if it is a large meeting with AV support, I recommend conforming to the desktop app and handing off a presentation file. This ensures you can focus on the presentation, not the technology setup and function. If it’s a small board room meeting and you feel confident in using newer technology, then mobile devices can be a good option. However, I recommend having a traditional computer, and the presentation on a memory drive – just in case. Let’s look at the different options currently available to work with when it comes to using mobile devices in presentations. This is a high-level reference and overview of the primary mobile devices that can be used for presentations. There are two types of connection options for getting a presentation from a device to the projector. Both are options. In general, using a wired connection is going to be easiest option, as it has the least technology needs (do to the cables, connect – done). The first option is wired connections. This is (obviously) physically connecting a cable to the mobile device. 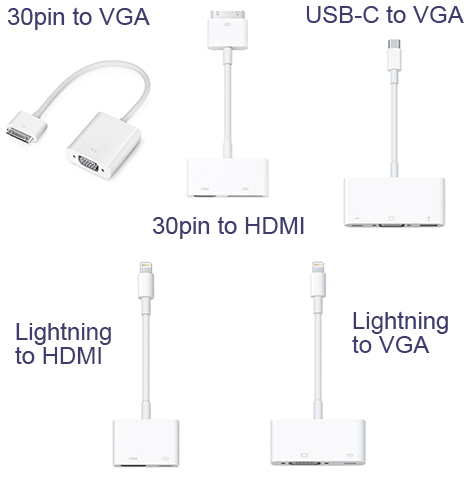 Each device type has a different connector, and then there are multiple options for the AV system you need to figure out (eg. 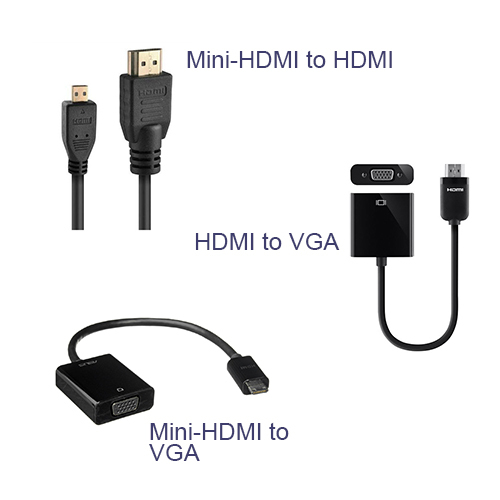 Is the AV system using VGA, HDMI or other display connector?). The second option is connecting your mobile devices using a wireless system. Keep in mind, most wireless display connectors need WiFi. And the WiFi needs to be fast enough for the presentation to display content and animations smoothly, and it needs to have enough coverage to connect in the meeting meeting room (ie. Not your hotel room or the lobby, but the actual ballroom). Miracast is a direct connection technology, so a WiFi network is not needed. Apple devices are easily the most popular and abundant (myself included with an iPhone and iPad). Apple devices need to connect to Apple TV, so you need the physical Apple TV device and a WiFi network for both the IOS device and Apple TV connect to (then the Apple TV connects to the AV System/projector/monitor). AirPlay is the IOS app (built in to all Apple devices) that make the wireless display work. My opinion on wireless presentations from IOS devices is that they work well, but have a lot of hardware and setup needs. If you use an Android mobile device, the Google Chromecast device is needed. The original Chromecast device was basically a small USB drive with an HDMI connector and additional mini-USB port for power. The new Chromecast device is a bit larger, more in line with an Apple TV size (but still just a USB power). Another option is many SmartTVs are Chromecast-ready and Android devices can stream direct to it with no additional hardware. No matter what Chromecast connector is used, WiFi is needed. Last, if you are using an Android device, a great app available in the Android Google Play App Store is AllCast, which enables Android devices to also connect to Apple TV, even more SmartTVs and the Amazon Fire TV. 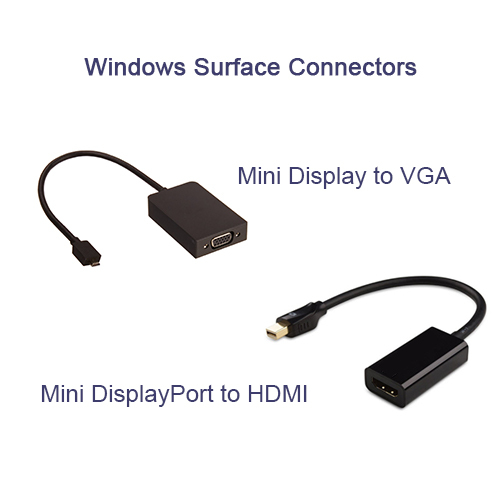 If you’re a Windows 10 Mobile device user, or Windows 10 desktop, the MiraCast wireless display software is built in. The interesting thing (and good thing), is MiraCast is not a Microsoft technology, but an industry wide wireless display platform that Microsoft has adopted and integrated into ALL Windows 10 devices (Note: It is also available on Windows 8.1 as a download in the Windows App Store). MiraCast is also available on Android devices as a separate app download, and it also works with IOS devices (but is not available through the Apple App store, so only works with “jail break” devices which I hope changes in the future). My opinion of MiraCast is this works the best of all wireless display options covered. Because it is an open standard, the physical dongle is not limited to one company and I have had some work great and others not work at all. I recommend the Microsoft manufactured device as I have had flawless operation of it (and it is very small like the original Chromecast device). The other really great feature is that MiraCast does not need WiFi, it will connect to any device using a local connection (so it does use WiFi, but not internet enabled WiFi). I hope the helps with an overview of many mobile device connection options and some of my (sometimes hard-earned) opinions on mobile devices for presentation use.